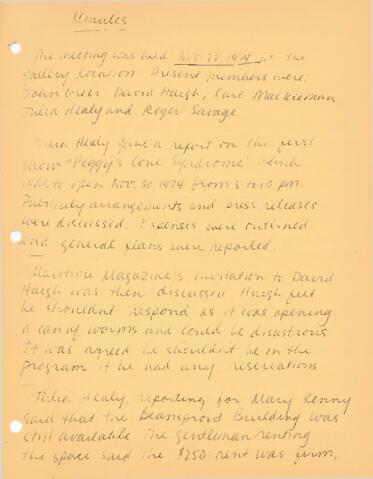 Item is handwritten set of minutes of the second meeting of the Board of Directors of Eye Level Gallery, held at an unknown location on November 28, 1974. Present members were John Greer, David Haigh, Karl MacKeeman, Julia Schmitt Healy, and Roger Savage. The lack of any non-artists meant the board did not have quorum according to the rules outlined in the minutes of the first meeting. Nevertheless, the board had a full meeting and made a number of decisions, including the approval of a Michael Fernandes show in January 1975. The board also expressed hope that the Nova Scotia Department of Recreation would "help solve" a budget deficit by providing funds. The membership's early interest in the documentation of the gallery's activities are reflected in the board's decision to photograph each show but not provide an honorarium to photographers. Minutes of the meeting are handwritten in ink on acidic pulp paper.